How Sales Professionals in the Top 10% get there…and stay! 5 out of 5 based on 42 ratings. 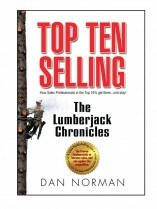 Dan Norman’s career in sales began in a logging camp high in the hills of North Georgia. Fresh out of college with a Bachelor of Fine Arts degree in Painting and Drawing, he was making his first sales call as a sales representative with Motorola. Locked in his car, dressed in a suit and surrounded by lumberjacks carrying chain saws, Dan was afraid to open the door! Long since that terrifying beginning, Dan has become a sales performance expert. In this small yet powerful book, Top Ten Selling, Dan examines the fundamental attributes of the very best salespeople that have propelled them to the top of their professions and kept them there year after year. Top Ten Selling is not a book about sales skills but rather a book about the mindset, characteristics, actions and motivation of the very best in sales. After more than 25 years of experience hiring, managing, and motivating top-performing sales employees, Dan has been able to catalog the attributes of the very best and brings them to us in Top Ten Selling. Whether you have “sales representative” on your business card or not, you will benefit from these fundamental principles for success and find that they can be applied throughout the workplace and life.